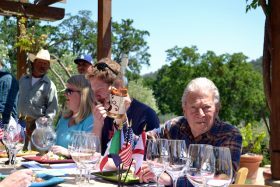 Bob Haas, along with the Perrin family of Chateau de Beaucastel in Chateauneuf, are the founders of Tablas Creek Winery, in Paso Robles, California. I have been smitten by the Patelin, rosé this year. That love led me to ask Bob if he might write about the Patelin, rosé for our website. He graciously agreed. Our rosé wine, Patelin de Tablas, is an inspiration that developed out of a vision that Jean-Pierre Perrin and I had in 1971 when he was accompanying me on visits to Vineyard Brands’ then Napa suppliers while we were traveling through California on a market visit. The vision was to partner in a winery producing a wine from Châteauneuf-du-Pape varieties in California. There was so much evident energy in the new California scene at that time that anything seemed possible. As Jean-Pierre commented, “Even the streets are being paved in stainless.” And in spite of what seemed to be a similar climate to the southern Rhône Valley, none of its typical grape varieties were part of the new Napa scene. Well, because the Perrins and I were busily engaged in building our developing businesses at the time, we did not get around to reaching out toward our California vision until the mid 1980s. We covered California thoroughly for five years in our search for the right combination of climate and soils. To preserve acidity, we needed cold nights to combat the hot sunny California days and we wanted chalky clay soils similar to those of Châteauneuf-du-Pape for our Rhône varieties: particularly Grenache, Mourvèdre, Roussanne, and Counoise. We found that combination and closed on a nice 120-acre pasture in Paso Robles in 1990. Of course, good clean material for the varieties we wanted to grow hardly existed in California, so we imported virus-free cuttings from our partners, brought them through the three-year USDA import program, received, multiplied, grafted and finally planted them starting in 1995. 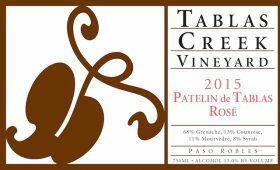 We made our first Tablas Creek Vineyard wine in 1997, the year we built the winery. At my wife, Barbara’s, request, we made our first rosé – a saigné of Mourvèdre, Grenache, and Counoise in 1999: 76 cases! Dry rosés had very little market appeal at the time but we were surprised by how fast it got bought up in our tasting room. We started something! So we grew to 1600 cases in 2014 and still it sold out rapidly. In order to keep our wines in distribution despite lower yields from a series of vintages marked by drought and frosts , we started our Patelin brand in 2012. It is a “neighborhood” brand. We buy the grapes from Paso Robles vineyards, grapes specifically destined to produce a pale pink style of the ever more popular French Rosé de Provence. The red grapes are directly pressed and only the juice is fermented so that the skin contact is minimal; the fruitiness is preserved in the wine, yet the wine is dry with good acidity. 2150 cases were produced in 2015. We love it! We make sure that we get a couple of cases of the new vintage in our cellar in Vermont every year to enjoy.